Words about how your process is the best. This client wanted a shooting jacket for clay pigeon shooting at his club. 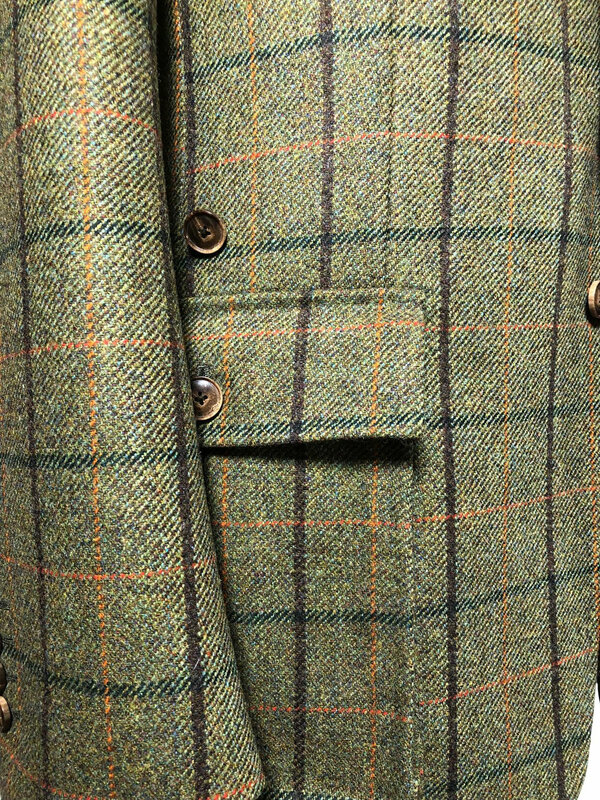 The cloth is a heavy Lovat tweed with a water resistant coating, the design is rather classic English with an action back and leather shoulder patch. Going that extra mile with the patten matching the check matches up perfectly at the pleat of the “action back” and we cut the pattern on the bias for the undercollar to give the pattern a more stylish look. Hip pockets are roomy with buttons up top to fasten the pocket open for easy access to shells. Its the 70s but in a good way! The silhouette is longer with slanted pockets and of course nothing says the 70s like brown corduroy. The trick is with pieces that have a certain historical look is to make them look fresh and modern while still keeping the cues that the viewer expects, it’s a bit like JJ Abrams doing the force awakens. Here you can see first a basted “throwaway” “try-on” made from different cloth and a forward or “slip on fitting” in the workshop. The slip on is something I often don’t need after the try on but with this lapel either working on the client or not I decided to hedge my bets and do a slip on fitting which is a finished garment without buttonholes which would allow me to make adjustments to the “expression” of the lapel. In any case it worked out great and didn’t need altering just a quick stop up to 59th street so Stella could put the buttonholes onto the coat. Typically for a new client I would do one try on fitting and then on the next visit the piece is ready to go save for perhaps minor alterations. After 18 years of doing fittings like this I am experienced enough to fit garments in one fitting however if the piece is complicated stylistically or I think the client may be a difficult fit I am also experienced enough to recognize that and do extra fittings and stages even up to doing throwaway try one and slip on fittings to get the desired result. 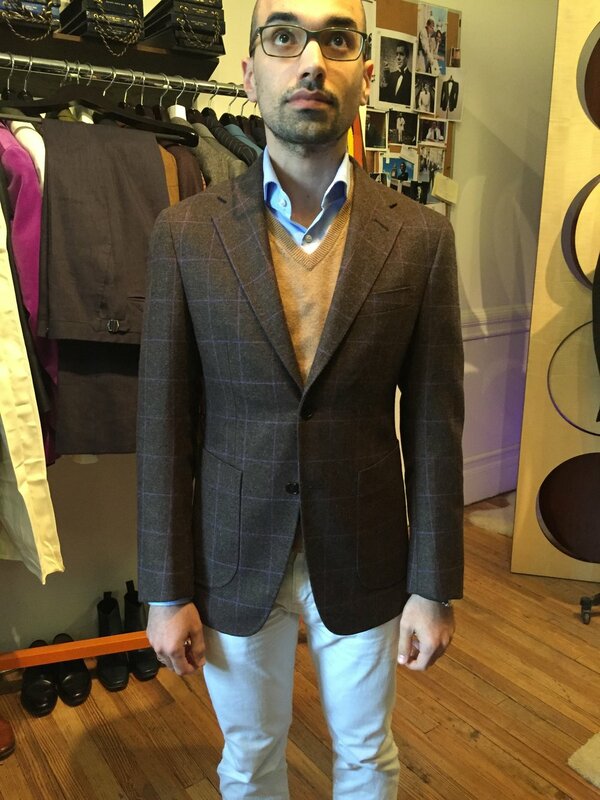 Often tailors will not recommend tackling a plaid jacket or suit the first time round because adjustments can mess up the pattern. I however make a false sleeve at the “try-on” stage. The change to the sleeve orientation is noted at the fitting and the real sleeve attached at the right “pitch” with perfectly matching plaids at the shoulder. This was made for a director of photography. The cloth is a heavy moleskin (brushed cotton) and the design is similar to a shooting jacket with action back for movement and big hip pockets. The color black was chosen because on the job this client was working the director insisted that everyone wear black on set. These pictures are at the try on stage before buttons and buttonholes were added. This is why we have try-on fittings, a rather good first fitting but sleeves are very short. Because we do this fitting we can lengthen the sleeve easily or if need be replace the entire sleeve for the next fitting. 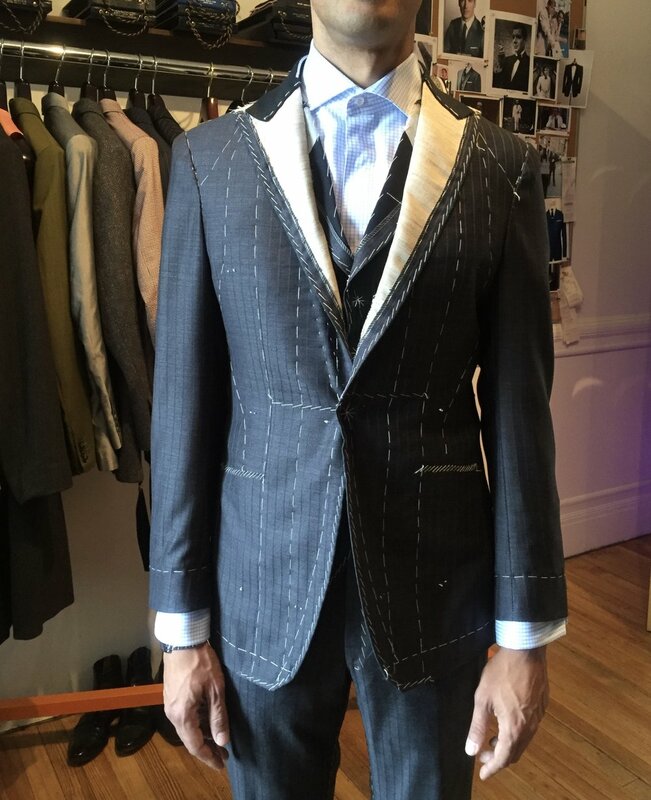 This step by step and “correct” approach to Bespoke tailoring always ensures perfect end results. My markings at the fitting are simple and unambiguous here an arrow points spent to indicate to drop the sleeve and the 1 1/4” mark is by how much. I always like to make the tailoring simple for clients with as few fittings as possible for there convenience to get the optimum result. This is a first time client and I was confident in the fit so I skipped the basted try on stage but still played it safe by doing a slip on fitting without buttonholes. Anyway the suit fit great after a minor sleeve adjustment and the client got his suit a month earlier.